Have you ever had a stack of heirloom tomatoes, fresh mozzarella and basil, drizzled with olive oil? It's truly a sensation for the tastebuds and the eyes with the tangy layers of tomatoes in varying shades, colours, shape and sizes. 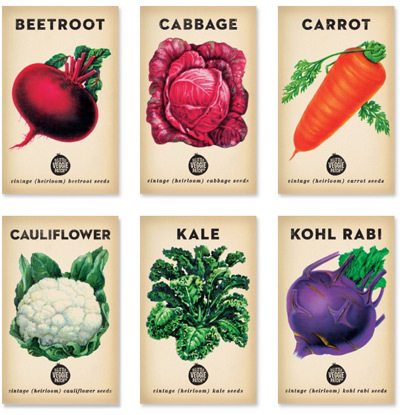 I just love the idea of saving our seed diversity and growing heirloom fruit, veggies and flowers, and with gorgeous vintage-style packaging like this, how can you resist these seed packets from Melbourne's The Little Veggie Patch Co.? Growing heirloom produce is a great way to experience food the way that our ancestors knew it - tastier, with longer harvest times, more variety in shape, size, colour and texture. These are all the characteristics that have been bred out of modern-day mass-grown produce to ensure more economical harvests (but where sadly, nutritional value and taste is secondary). Using heirloom seeds is also a great way to protect against extinction of these fabulous varieties. According to The Little Veggie Patch Co, an heirloom vegetable is "a cultivar that was commonly grown pre 1950′s, but which is not used in modern large-scale agriculture. Many heirloom vegetables have kept their traits through open pollination. Due to their genetics, they are often resistant to local pests, diseases, and extremes of weather." So what are we waiting for! The Little Veggie Patch Co. selection of seeds includes beetroot, cabbage, carrot, cauliflower, kale, kohl rabi, beans, capsicum, celeriac, coriander, leek, mustard, chilli, corn, cucumber, eggplant, lettuce, onion, pumpkin, rockmelon, radish, spinach, squash, swiss chard, peas, watermelon, cosmic purple carrot, tomatoes (black russian, burnley surecrop, tommy toe, yellow pear), nasturtium and marigold. What a fabulous gift. You can find The Little Veggie Patch Co. heirloom seeds in the online store as well as stockists around Australia. Images: The Little Veggie Patch Co.